Engine. 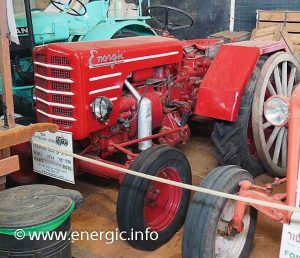 Motor Cérès P-25 diesel 4 stroke, 2 cylinders, 1805 cm3, developing 27cv at 2 000rpm. 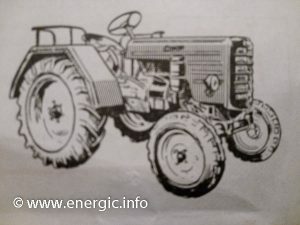 (1958), Alésage x course : 100 x 115 mm, water cooled. See/Voir more information on Cérès moteurs here. 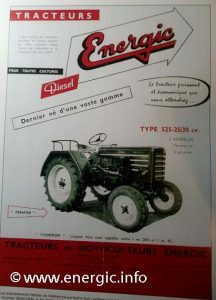 Energic agricole show 1958 internal large stand highlighting the Energic 525 diesel tracteurs fermier and vigneron on the right. 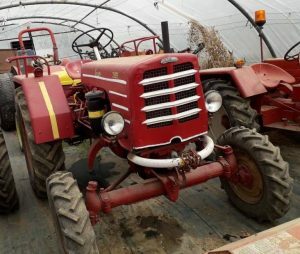 With tracteurs 518 behind. Lubrication. 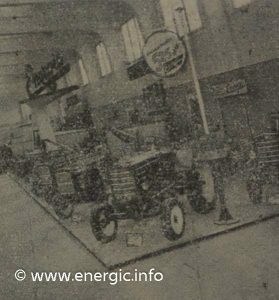 By constant circulation of oil held within the sump of the engine, 3.5 liters. The circulation by pumped pressure also from from crankcase compression. (Graissage par pompe incorporée). Cooling. One large aluminium fan which is mounted at the front of the engine, running on ball bearings. This system draws air into the hood circulating around the engine, ensuring cooling. this system was tested in extreme high temperatures and proved effective. (Refroidissement par air forcé (ventilateur puissant). Air filter/Cleaner. Metallic element in bath of oil. 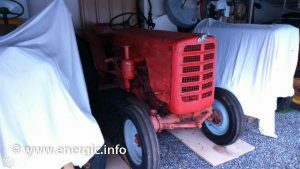 Carburateur. Zénith with lever for easier starting. in the cold. ( Zénith tous terrains, avec volet d’air pour départs à froid). Gears. With a 5 speed gear box and 1 reverse. Differential lockable. Clutch. 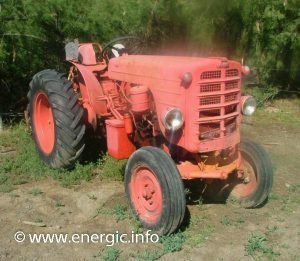 Single dry disc, PTO normal and independent. Wheels. 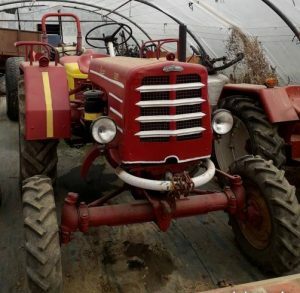 Front wheels 550 x 16, rear wheels 10 x 28. Brakes. 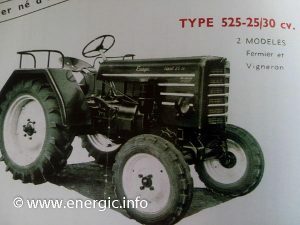 Drum brakes,semi adjustable, On each rear wheel shoe type, pressure by manual foot pedals, independent that can be linked. Hitch. 3 point lift manual, hydraulic lift available as option. Speeds in gears. 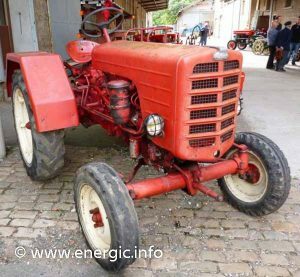 1ère : 2,37 km/h, 2ème : 4,38 km/h, 3ème : 6,90 km/h, 4ème : 10,7 km/h, 5ème : 20,8 km/h, 1 ère AR : 4,24 km/h. 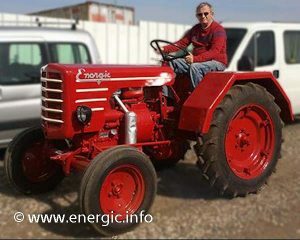 Energic 525 Tracteur diesel Fermier version. 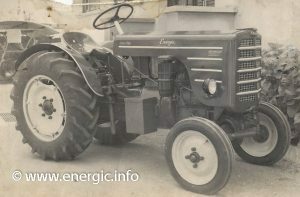 Energic 525 Tracteur diesel Fermier version front view. 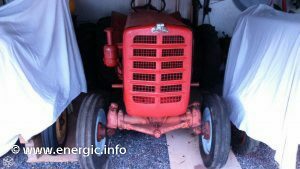 Model Energic tracteur 525 Vigneron. 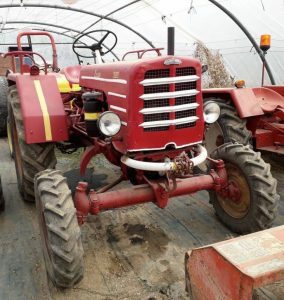 Same specification as Fermier except the width can be reduced to 106.4cms if required. The rear mud gaurds are changed to a thinner profile and the axles are reduced to facilitate a min. width. The weight will also be reduced.